Road trippers are forever looking for new hidden gems. Sometimes old dogs can teach you new tricks.Wichita isn’t a new place, but it might as well be, the past five years injecting a previously unfound energy and as a result a new sense of pride amongst locals. When planning your next cross-country trip, there’s a bunch of good reasons to give Wichita–and Kansas–a try. First Off, You’re Not a Tourist–You’re a Visitor. When you visit a big city, you’re one of millions. The place is brimming with transplants and out-of-towners at all times of the year. Never in a lifetime would a shop owner or fellow bar patron recognize you as a visitor—as someone to engage. Even if they did, you’re just another tourist and they’ve seen you, or someone like you, many times before. 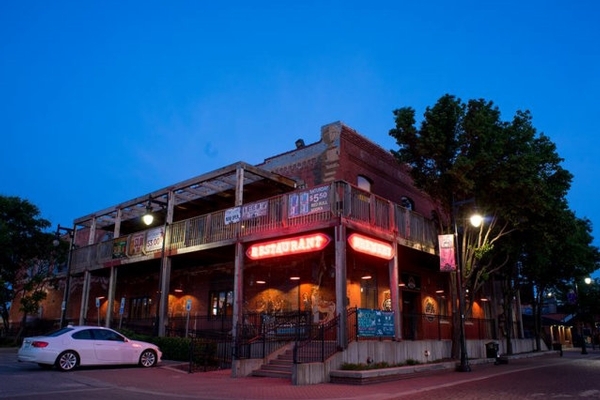 But in small towns like Wichita, where internationalism and/or tourism has yet to fully take root, handshakes in the local restaurants, bars, shops and music venues result in personal, genuine connections and these people are interested in making sure you have fun in their small hometown. Part of that is because they simply don’t get a lot of visitors and are intrigued to know why you came. Another part is the small-town charm, pride and hospitality–-people who live here grew up here. The shop owners, beer brewers, food-makers, music-makers, all of them are connected and most likely went to high school together. So, when you sit down at the bar, your chances of being discovered and engaged as an out of towner are very high. And when you ask where they like to go for a beer, they won’t just recommend their favorite brewery, they will call up their friend who works at the brewery and take you over to introduce you. In this way, small towns and cities can make you feel like a celebrity. In the case of Wichita, you’ll find the hospitality usually associated with the south: People were inviting me back to their houses for barbecues, brewers were insisting I come into the back to see the tanks; one even took me to his other favorite brewery in town. Restaurant owners were calling their friends to come meet me or walking me over to a table of their friends so I could hang out. A local jeans maker even closed his shop early to take me on a drive around the city. In this type of town, it’s easy to make a connection (no cell phone needed). You’re not a tourist–you’re a visitor. Big difference. Most people remember the cattle drive history as it relates to the Stockyards in Fort Worth, or more specifically, Hell’s Half Acre at the beginning of the historic Chisholm Trail. Well, the end of that trail is just across the river from Wichita in a small area called Delano, which today is an extension and expansion of the city, filled with locally-owned bars and shops. Back then, in the late 1800s, the town was the end of the road for the cowboys, a place of decompression after months on the trail and in the wilderness. It was the first place they went to unwind once they were paid for driving the cattle and it got so rowdy that it was considered by Wichita locals as a completely separate town and not part of Wichita. As the story goes, the local newspapers took this separation to heart, refusing to cover the debauchery, because it technically wasn’t part of the city despite its looming, unignorable presence. Speaking of cattle, Wichita’s proximity to Kansas City (200 miles) means an influenced and inspired barbecue scene, its main local joints being Rib Crib, Delano BBQ, Bite Me BBQ, and B & C Barbecue. Kansas City-style barbecue features slow-smoked meat over various woods with the addition of a thick, tomato and/or molasses-based sauce. You’ll want to revolve at least a few of your meals around this tasty scene. They Like to Drink Beer. A Lot of It. For me, a beer-drinking town is a friendly town—and the sign of a progressive one. The craft beer community is known country-wide as being one of the most communal, cooperative industries, setting the tone for a good buzz, both from the beer in the glass and all those who gather to enjoy it. In spite of its small population (plus/minus 300,000 residents), the tiny city has a half-dozen breweries and more than a handful of beer bars, including Wichita Brewing (which just celebrated its sixth anniversary), River City Brewing Co (Wichita’s first brewery, opened in 1993), Hopping Gnome (solid hoppy beers, funny gnome taps) and Central Standard (the best indoor/outdoor taproom and social atmosphere). Despite its great, storied history and present-reality as a hub of airplane construction and manufacturing (which you can learn about in detail at the historical museum inside the former 1892 City Hall building), Wichita’s location makes it a great target for road trippers. While Kansas might be stereotypically referred to as a fly-over or drive-through state, I think road trippers would be happy to break up their itinerary f they knew there was something worth stopping for—all that’s left is for Wichita to get the word out. As the city continues to bubble, you can expect more travelers to pop in on a short detour as they pass through on east-west, cross-country, I-70 journeys. Also, you should make it a point to check it out now, before that happens. Coincidentally, its position on the map is why it also has a great music scene—bands touring the country pop in to play at venues like Barleycorn’s.